NOTE: If you’re bold, you could even print out and frame this article, then attach individual names to where they belong with Post-It notes. You’re welcome in advance for this idea! This is a mission trip? I’m just here to bargain shop the street vendors. This student becomes an expert and bartering and tries to haggle with the airport barista at Starbucks™ on the way home, too. They have a list of people they need to shop for which absolutely consumes them and in some cases even brought an extra suitcase for their haul. Which is good because now they’ll have a chance to negotiate the extra bag fee at the airport check-in counter. There’s an overzealous Christian kid on every youth group trip. He or she will bring their Bible in a protective case to everything and make other students feel guilty for not doing the same. They hold up the vans to pray over someone. Actually, now that I describe them, they don’t sound so bad after all. I wish I had a couple of these in my youth group. Why do all my students want to just take pictures and buy stuff? OK, so we’re obviously having a bit of fun here. The prayer for all our students, even if they come just for the pictures or souvenirs or whatever their motivation is – is that they would experience life-change brought about by our Savior Jesus Christ. Mission trips local and global are a powerful tool in our ministry to students. 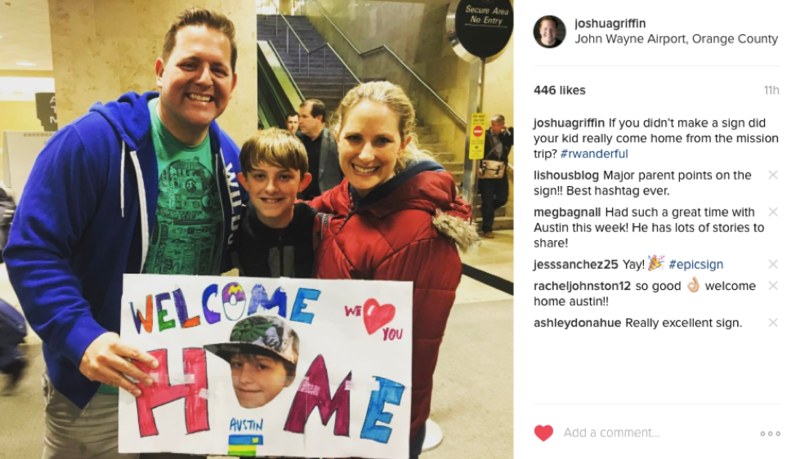 In fact, just recently my wife and I got to welcome our son home Austin in the airport and it was incredible. 1) He was SO embarrassed by our sign, 2) I’m SO thankful for people who believe in him and helped fund his trip. It WAS life-changing and one he’ll remember forever. You can’t help but laugh inside just a little bit when you see a student going all in on pictures with their $5,000 DSLR Canon camera. In the slums. With gear that would make an aspiring wedding photographer jealous. Or when you see a student with 15 bags of souvenir shopping swag like this was a trip to the mall with a Back to School clearance sale. Maybe even nudge them just a little bit if it’s too far over the top. But most of all, sit back and enjoy the fact that for many if not all of them – this is a defining trip for their worldview, their faith, their life. And you got to have a little part in leading them to that deeper place. Well done. OK, now get those sticky notes and get cracking!